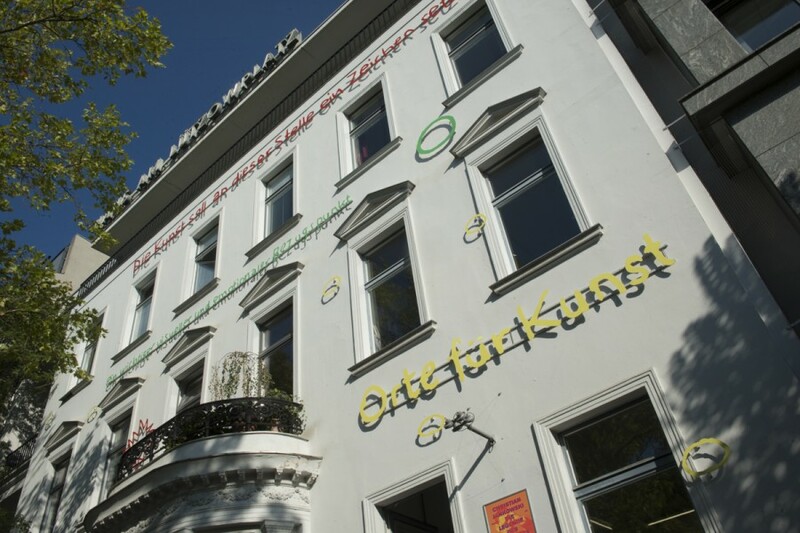 Since September 2016, on the facade of Haus am Lützowplatz different slogans are mounted with graphical markings shaped in the artist’s handwriting: ” Orte für Kunst” [places for art] surrounded by yellow ovals, “Rolle der Kunst: die Kunst soll an dieser Stelle ein Zeichen setzen” [the role of art: art shall make a mark at this position] along with a red star and “ein wichtiger visueller und emotionaler Bezugspunkt” [an important visual and emotional reference point] next to a green circle. The starting point of the project was an invitation in 2010, asking Christian Jankowski to create a site-specific work for the new Berlin airport BER. Jankowski then received a dossier of statements from a private agency, whom the builders had assigned to supervise the art-in-architecture competition. This dossier included simulations of interior and exterior views of the future building, as well as highlighted markings indicating the dimensions and the exact positions designated for art. In the entrance hall, there was, for example, a red rectangle, marking the space reserved for a piece of art with a “Grand Gesture”, to be “visible from all sides”. Jankowski’s work, that was realized 2012 as part of the public sculpture project in Zurich, serves as the meta level of an art-in-architecture project: the creative endeavor of the private company that documented the expectations, requirements, and conditions to make art, is itself transformed into art. The dossier overtly announces the intended function art should play. The building principal was looking for an art that attracts attention and arouses emotions. The notations of the private agency become the large-scale language and character sculpture in painted aluminum and is now no longer in the simulation of an internal concept paper, but in public. The work was part of the solo exhibition by Christian Jankowski, Die Legende des Künstlers und andere Baustellen [The Legend of the Artist and other Construction Sites] (15 September to 20 November 2016) at Haus am Lützowplatz, passing into its possession thereafter. A second version of the work exists since 2014 at the U-Bahn station Donauspital in Vienna and was realized in Kooperation with KÖR – Kunst im öffentlichen Raum Wien.